When she became famous in the ‘60s for being the wife of a Beatle, Cynthia Lennon’s own artistic talent was overshadowed. 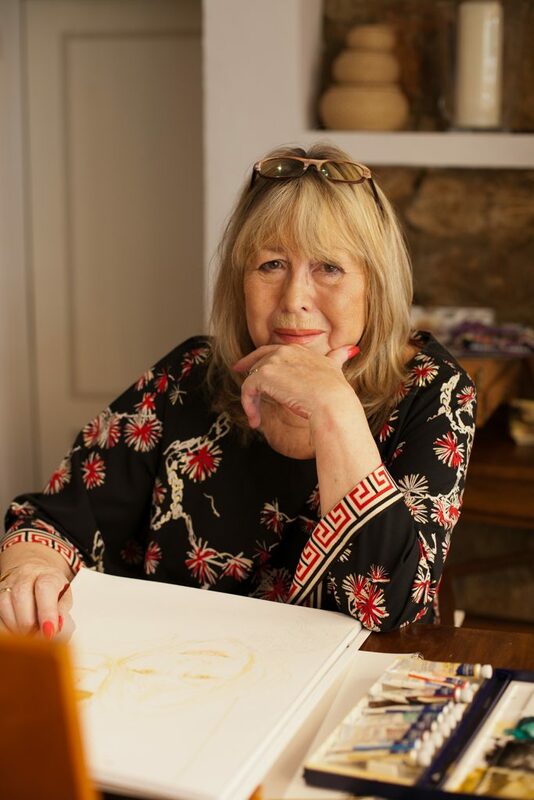 Jan Edwards finds out more about the Mallorca-resident illustrator. Falling pregnant with John’s child changed all that. “I don’t want to talk about The Beatles anymore,” says the author of the books ‘A Twist of Lennon’ and ‘John’. We’re at her Bendinat home, where her illustrations are everywhere: on the walls, in the room she uses as her studio, and spread out on tables for us to see. There are designs she did for Vantona Viyella textiles, and the packaging for her 1980s’ perfume ‘Woman’. Her favourite medium is watercolour pencils, in black and white or sepia. “I’m not a painter: I’m an illustrator, a linear artist. I do lines.” Unlike many artists living on Mallorca, she is inspired and fascinated by people, rather than scenery. Which is her most representative work? “That’s a hard one. In 2002, Cynthia married her fourth husband, Barbadian nightclub owner Noel Charles – a long-term friend of her multi-talented son. Julian Lennon suggested that they move from Normandy to Mallorca – where he also was looking for a place to live – and they came to Bendinat. Cynthia has had domestic help from a young Ukrainian couple for the past seven years. “They live with their little boy at the bottom of the garden,” she says, making them sound like something from a fairy tale. “When Noel was really ill, Natalie and her husband Andreas were like angels. If God doesn’t come, he sends.” The couple’s affection for her is evident: their son, who is six this month, is named Julian. Her affection for them was expressed in her recent drawing of the young family. She doesn’t have aspirations to become a famous artist: “Just to satisfy my creative urges and take my mind off a lot of things I want my mind taken off.” She believes that any degree of talent should be used. “I had all those years of training, with so many interruptions. Now all of a sudden, and tragically, I have the space to start again. Even if it’s just one picture from the heart, I would like Noel to be proud of me; I’d like Julian to be proud of me. The artist is starting over.